M. Smotherman and D. Spicer, “Historical Reflections: IBM’s Single-Processor Supercomputer Efforts – Insights on the pioneering IBM Stretch and ACS projects”, Communications of the ACM, Vol. 53, No. 12, pp.28-30, December 2010. M. Smotherman, “IBM Advanced Computing Systems (ACS) -- 1961 – 1969”, historical reconstruction website, Clemson University. L. Conway, "IBM-ACS: Reminiscences and Lessons Learned from a 1960's Supercomputer Project"; in: C. B. Jones, J. L. Lloyd, (Eds. ), Dependable and Historic Computing: Essays Dedicated to Brian Randell on the Occasion of his 75th Birthday, Springer-Verlag, pp.185-224, 2011. L. Conway, B. Randell, D. Rozenberg, D. Senzig, “Dynamic Instruction Scheduling,” ACS Memorandum, IBM-ACS, February 23, 1966. L. Conway, "Lynn Conway's IBM-ACS Archive", lynnconway.com. H. Garfinkel, Studies in Ethnomethodology, Prentice Hall, Englewood Cliffs, N.J., 1967. L. Conway, “The Computer Design Process: A Proposed Plan for ACS”, ACS Memorandum, IBM-ACS, August 6, 1968. B. O. Evans, “The Ill Fated ACS Project”: pages 27-28 in Evans’ memoir The Genesis of the Mainframe, Wilhelm G. Spruth, ed., University of Leipzig, Department of computer science, June 2010. L. M. Terman, "MOSFET Memory Circuits", Invited Paper, Proceedings of the IEEE, Vol. 59, No. 7, pp. 1044-1058, July 1971. R.F. Lyon, p.e.c., March 29, 2012. B. Hoeneisen and C. Mead, "Fundamental Limitations in Microelectronics-I. MOS Technology," Solid State Electronics, Vol. 15, pp. 819-829, 1972. R. Bassett, To the Digital Age: Research Labs, Start-up Companies, and the Rise of MOS Technology, Johns Hopkins University Press, 2002. R. K. Booher, "MOS GP Computer," Proceedings of the Faill Joint Computer Conference, AFIPS '68 (Fall, part I), pp.877-889, 1968. L. Boysel and J. Murphy, "Four-phase LSI logic offers new approach to computer designer", Computer Design, pp. 141-146, April, 1970. F. Faggin, “The Making of the First Microprocessor”, IEEE Solid-State Circuits Magazine, pp. 8-21, Winter 2009. R. Bower and R. Dill, "Insulated gate field effect transistors fabricated using the gate as source-drain mask”, Electron Devices Meeting 1966 International, pp. 102–104, 1966. R. H. Dennard, F. H. Gaensslen, H. N. Yu, L. Rideout, E. Bassous and A. R. LeBlanc, “Design of Ion-Implanted MOSFET’S with Very Small Physical Dimensions”, IEEE Journal of Solid-State Circuits, Vol. SC-9, No. 5, pp. 256-268, October 1974. I. Sutherland, C. Mead and T. E. Everhart, “Basic Limitations in Microcircuit Fabrication Technology”, R-1956-ARPA, November 1976. I. Sutherland, “The Problem: How to build digital electronic circuits from now to 1985”, Letter to W. R. Sutherland describing the challenges presented by advances in microelectronics and proposing the Xerox-PARC/Caltech collaboration, January 26, 1976. L. Conway, Ed., “The VLSI Archive: An online archive of documents and artifacts from the Mead-Conway VLSI design revolution”, lynnconway.com. I. Sutherland and C. Mead, “Microelectronics and Computer Science”, Scientific American, pp. 210-228, November 1977. C. Mead and L. Conway, Introduction to VLSI Systems, Xerox PARC, laser-printed prepublication versions: Chapters 1-3, October 1977; Chapters 1-5, February 1978; Chapters 1-9, July 1978. C. Mead and L. Conway, Introduction to VLSI Systems, Addison-Wesley, 1980. R. Hon and C. Sequin, A Guide to LSI Implementation, Xerox PARC Tech. Report, 1st Ed., September 1978; 2nd Ed., January 1980. L. Conway, The M.I.T. '78 VLSI System Design Course: A Guidebook for the Instructor of VLSI System Design, Xerox PARC, August 12, 1979. L. Conway, A. Bell and M.E. Newell, “MPC79: The Large-Scale Demonstration of a New Way to Create Systems in Silicon”, Lambda, pp. 10-19, Second Quarter 1980. L. Conway, “The MPC Adventures: Experiences with the Generation of VLSI Design and Implementation Methodologies”, Xerox PARC Technical Report VLSI-81-2, January 1981. T. Kuhn, The Structure of Scientific Revolutions, 2nd Ed., Univ. of Chicago Press, Chicago, 1970. D. Fairbairn and J. Rowson, Lambda, the Magazine of VLSI Design, First Quarter, 1980. MOSIS, “The MOSIS Service – More than 50,000 designs in over 25 years of operation”, mosis.com. M. Marshall, L. Waller, and H. Wolff, “The 1981 Achievement Award: For optimal VLSI design efforts, Mead and Conway have fused device fabrication and system-level architecture”, Electronics, pp. 102-105, October 20, 1981. E. M. Rogers, Diffusion of innovations, New York: Free Press, 1962. Computer Science and Telecommunications Board, National Research Council, Funding a Revolution: Government Support for Computing Research, National Academy Press, pp. 113-122, 1999. M. Stefik and L. Conway, “Towards the Principled Engineering of Knowledge”, AI Magazine, Vol. 3:3, pp. 4-16, Summer 1982. L. Conway, “The Design of VLSI Design Methods”, Proc. of ESSCIRC’82: Eighth European Solid-State Circuits Conference, Brussels, Belgium, pp. 106-117, September 22-24, 1982. M. Cassidy, “Chip inventors getting their due at Hall of Fame induction”, San Jose Mercury, April 30, 2009. D. B. Davis, “Assessing the Strategic Computing Initiative”, High Technology, April 1985. M. A. Hiltzik, “Through the Gender Labyrinth: How a bright boy with a penchant for tinkering grew up to be one of the top women in her high-tech field”, Los Angeles Times Magazine, Cover story, Sunday November 19, 2000. IEEE Computer Society, “Lynn Conway, 2009 Computer Pioneer Award Recipient,” January, 2010. W. R. (Bert) Sutherland, "Management of Industrial Research: Exploring the Unknown Technical Future", Perspective Series 2008-7, Sun Labs, July 2008. W. R. (Bert) Sutherland, “Faith, Funds, & Fate: Prerequisites for the development and transfer of new technology”, Presentation at the celebration of the 40th anniversary of USC-ISI, Marina del Rey, California, April 26, 2012. L. Conway, "The VLSI Archive", Electronic Design News, June 3, 2009. L. Conway, "THE M.I.T. 1978 VLSI SYSTEM DESIGN COURSE", lynnconway.com, 2007. L. Conway, A. Bell, M. Newell, R. F. Lyon, and R. Pasco, “Implementation Documentation for the MPC79 Multi-University Multiproject Chip-Set”, Systems Science Laboratory, Xerox Palo Alto Research Center, Jan. 1, 1980. L. Conway, "MPC79 Chip Photos", lynnconway.com, 11-20-07. L. Conway, "MPC79 Designers and Their Projects", lynnconway.com, 11-20-07. L. Conway, "Archive of MPC79 messages, notes and files", lynnconway.com, 4-08-08. T. Strollo, T. Doughty, G. Krasner, M. Stone, W. Wilner, D. Cohen, "Documentation for Participants in the MPC580 Multiproject Chip-Set", lynnconway.com, 7-07-80. G. L. Steele, G. J. Sussman, "Design of LISP-based Processors, or SCHEME: A Dielectric LISP, or Finite Memories Considered Harmful, or LAMBDA: The Ultimate Opcode", AI Memo 514, M.I.T. Artificial Intelligence Laboratory, Mar. 1979. J. Holloway, G. L. Steele, G. J. Sussman, Alan Bell, “The SCHEME-79 Chip”, AI Memo 559, M.I.T. Artificial Intelligence Laboratory, Jan. 1980. J. H. Clark, “Structuring a System Architecture”, Lambda, Second Quarter 1980, p.25-30. R. Rivest, “A description of a Single-Chip Implementation of the RSA Cipher”, Lambda, Fourth Quarter 1980, p.14-18. D.Fitzpatrick, J. Foderaro, M. Katevenis, H. Landman, D. Patterson, J. Peek, Z. Peshkess, C. Séquin, R. Sherburne, K. Van Dyke, “A RISCy Approach to VLSI:”, Lambda, Fourth Quarter 1981, p. 14-20. R. F. Lyon, “A Bit-serial VLSI Architectural Methodology for Signal Processing”, in VLSI 81 – Very Large Scale Integration, J. P. Gray, Ed., Academic Press, 1981, p. 131-140. H. Fuchs and J. Poulton, “Pixel-Planes: A VLSI-Oriented Design for a Raster-Graphics Engine”, VLSI Design Magazine, Third Quarter 1981, p. 20-32. R. F. Lyon, “The Optical Mouse, and an Architectural Methodology for Smart Digital Sensors”, Xerox PARC Technical Report VLSI 81-1, Aug. 1981. J. Hennessey, N. Jouppi, F. Baskett and J. Gill, “MIPS: A VLSI Processor Architecture”, in VLSI Systems and Computations, H.T. Kung, R. Sproull and G. Steele, ed., Computer Science Press, 1981 (Proc. of the CMU VLSI Conference, Oct. 19-21, 1981), p. 337-346. D. A. Patterson and C. H. Séquin. "RISC I: A Reduced Instruction Set VLSI Computer,'' Conf. Proc. 8th Annual Symposium on Computer Architecture, Minneapolis, Minnesota, May 12-14, 1981, pp 443-457. J. Cocke and V. Markstein, "The evolution of RISC technology at IBM", IBM Journal of Research and Development, Jan. 1990, Vol. 34, No.1, p. 4 - 11. C. H. Séquin, personal electronic communication re RISC, July 14, 2011. R. F. Lyon and M. P. Haeberli, “Designing and Testing the Optical Mouse”, VLSI Design Magazine, Jan-Feb 1982, p. 20-30. Proceedings of the 15th Conference on Design Automation, 19-21 June 1978, p. 188 – 192. R. F. Sproull and R. F. Lyon and, “A CIF Primer”, in R. Hon and C. Séquin, A Guide to LSI Implementation, Xerox PARC Tech. Report; 2nd Ed., Jan. 1980, p. 79-123. D. Johannsen, “Bristle-Blocks: A Silicon Compiler”, DAC '79 Proceedings of the 16th Design Automation Conference, 1979, p. 310-313. C. M. Baker and C. J. Terman, “Tools for Verifying Integrated Circuit Designs”, Lambda, Fourth Quarter, 1980, p. 22-30. C. M. Baker, Artwork Analysis Tools for VLSI Circuits, M.S. Thesis, MIT/LCS/TR-239, M.I.T.,1980. R. E. Bryant, “An Algorithm for MOS Logic Simulation”, Lambda, Fourth Qtr, 1980, p. 46-53. R. E. Bryant, A Switch-Level Simulation Model for Integrated Logic Circuits, Ph.D. Thesis, MIT/LCS/TR-259, M.I.T., Mar. 1981. J. Ousterhout, “Caesar: An Interactive Editor for VLSI Layouts”, Lambda, Fourth Qtr, 1981, p. 34-38. C. J. Terman, Simulation Tools for Digital LSI Design, Ph.D. Thesis, MIT/LCS/TR-304, M.I.T., 1983. J. Ousterhout, “Crystal: A Timing Analyzer for nMOS VLSI Circuits”, Proc. of the 3rd Caltech Conference on VLSI, Mar. 21-23, 1983. J. Ousterhout, G. Hamachi, R. Mayo, W. Scott, G. Taylor, “Magic: A VLSI Layout System”, Computer Science Div., Elect. Eng. and Comp. Science, U. C. Berkeley, Dec. 2, 1983. 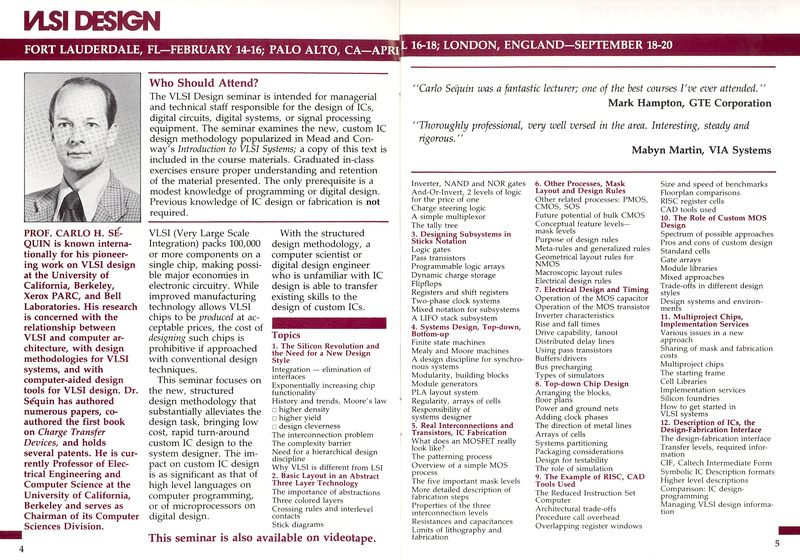 “Schedule for the 21st Design Automation Conference, Albuquerque, NM”, VLSI Design Magazine, May 1984, p. 28-32. S. Trimberger, “Moore’s Law, FPGAs and Computation”, Xilinx Research Labs, March 2006. D. G. Fairbairn, J. Newkirk, R. Mathews, “Introduction to VLSI System Design”, Internal HP Video Course; later offered by VTI (1982). C. Sequin, "VLSI Design", Hellman Associates, 1981, 1983, 1984. L. Conway, “MEAD-CONWAY COURSE INSTRUCTORS, AS OF '82-'83”, Xerox PARC, June 1983. Interner Bericht 28/80, Fachbereich Informatik, Universität Kaiserslautern, 1980. W. Jansen and D. G. Fairbairn, “The Silicon Foundry – Concepts and Reality”, Lambda, 1st Quarter 1981; p.16-26. J. Werner, “Silicon Foundry Status Report”, VLSI Design Magazine, July/August 1982; p.12. D. G. Fairbairn, “A Survey of Silicon Foundries”, VLSI Design Magazine, July/August 1982; p. 42-49. J. C. Mudge and R. J. Clark, “Australia’s First Multi-Project Chip Implementation System”, Proc. Microelectronics '82: A National Conference on Microelectronics, Adelaide, May 1982; p. 72-77. G. Lewicki, "Prototyping and Small-Volume Parts through MOSIS", ISI Reprint Series, ISI/RS-85-160, Nov. 1985. R. Hartenstein, “History of the E.I.S. Project”, Universität Kaiserslautern, 2000. B. Courtois, K. Torki, S. Dumont, S. Eyraud, J-F Paillotin, G. di Pendina, “Infrastructures for Education and Research: from National Initiatives to global operations”, Proc. of the 13th World Multi-Conference on Systemics, Cybernetics and Informatics: WMSCI 2009, Orlando, Florida. K. Wölcken, “EUROCHIP, the birth of a strategic action”, video of talk at special IMEC symposium: "EUROPRACTICE : 20 Years of microelectronics education in Europe - Celebrating the past - Planning the future", Sep. 17, 2009. Computer Science and Telecommunications Board, National Research Council, Funding a Revolution: Government Support for Computing Research, National Academy Press, 1999; p. 113-122. SGI, MIPS, SUN, ARM, Cadence, Valid Logic, Daisy, Mentor Graphics, Viewlogic. C. P. Steinmetz, Theory and calculation of alternating current phenomena, 3rd Ed., with assistance of E. J. Berg,, Electrical World and Engineer, 1900. H. C. Hill, The Wonder Book of Knowledge, John C. Winston Co., 1927. C. E., Shannon, “A Symbolic Analysis of Relay and Switching Circuits”, unpublished MS Thesis, Massachusetts Institute of Technology, Aug. 10, 1937. C. E., Shannon, “A Symbolic Analysis of Relay and Switching Circuits”, American Institute of Electrical Engineers Transactions, 57 (1938), 713-723. Gordon E. Moore, "Cramming more components onto integrated circuits”, Electronics, Volume 38, Number 8, April 19, 1965. R. W. Bower and R. G. Dill, "Insulated gate field effect transistors fabricated using the gate as source-drain mask". Electron Devices Meeting, 1966 International (IEEE), Vol. 12, pp. 102–104, 1966. R. K. Booher, "MOS GP Computer," Proceedings of the Fall Joint Computer Conference, AFIPS '68 (Fall, part I), 1968, pp.877-889. L. Boysel and J. Murphy, "Four-phase LSI logic offers new approach to computer designer", Computer Design, p. 141-146, April, 1970. L. M. Terman, "MOSFET Memory Circuits", Invited Paper, Proceedings of the IEEE, Vol. 59, No. 7, July 1971, p. 1044-1058. C. G. Bell and A.Newell, Computer Structures: Readings and Examples, McGraw-Hill, 1971. P. Richman, MOS Field-Effect Transistors and Integrated Circuits, John Wiley & Sons, 1973. C. H. Séquin and M. F. Tompsett, Charge Transfer Devices, Academic Press, 1975. R. T. DeLamarter, Big Blue: IBM's Use and Abuse of Power, Dodd, Mead and Co., 1986. G. Gilder, Microcosm: The Quantum Revolution in Economics and Technology, Simon & Shuster, 1989. T. J. Watson, Jr., Father, Son & Co.: My Life at IBM and Beyond, Bantam [paperback], 1990. P. Carroll, Big Blues: The Unmaking of IBM, Crown Publishers, Inc., 1993. Committee on Criteria for Federal Support of Research and Development, National Research Council, Allocating Federal Funds for Science and Technology, National Academy Press, 1995; Fig. II.13 “Technological Developments in Computing”, p. 75. R. Bower, "Hall of Fame Inventor Profile", National Inventors Hall of Fame, 1997. R. B. Fair, “History of Some Early Developments in Ion-Implantation Technology Leading to Silicon Transistor Manufacturing”, Invited Paper: Proceedings of the IEEE, Vol. 86, No. 1, Jan. 1998. R. Ayres, "A narrative history and description of MOSIS software", Journal of Systems and Software, Volume 43, Issue 1, October 1998, Pages 67-82. Transistor, 1945-1975, PhD dissertation, Princeton University, 1998. R. K. Bassett, To the Digital Age: Research Labs, Start-up Companies, and the Rise of MOS Technology, Johns Hopkins University Press, 2002. R. K. Bassett, "When is a Microprocessor Not a Microprocessor? The Industrial Construction of Semiconductor Innovation", pages 115-134 in Exposing Electronics, Artefact Series: Studies in the History of Science and Technology by the Deutsches Museum, the Science Museum and the Smithsonian Institution, B. Finn, Ed. ; University of Michigan Press, 2003. C. A. Mead, “Transcript of Interviews Conducted by Arnold Thackray and David C. Brock at Woodside, California on 30 September 2004, 8 December 2004, and 15 August 2005, Chemical Heritage Foundation Oral History Program, 315 Chestnut Street, Philadelphia, PA 19106. Bo Lojek, History of Semiconductor Engineering, Springer, 2007. F. Faggin, “The Making of the First Microprocessor”, IEEE Solid-State Circuits Magazine, Winter 2009, p. 8-21. S. H. Caldwell, Switching Circuits and Logical Design, John Wiley & Sons, 1958; See especially: Chapter 7: Symmetric Functions, p. 236-274; Chapter 8: Synthesis of non-series-parallel contact networks, p 274-318. M. Phister, Jr., Logical Design of Digital Computers, John Wiley & Sons, 1958. D. N. Leeson and D. L. Dimitry, Basic Programming Concepts and the IBM 1620 Computer, Holt, Rinehart and Winston, 1962. L. Conway, B. Randell, D. Rozenberg, D. Senzig, "Dynamic Instruction Scheduling" (tutorial), IBM-ACS, February 23, 1966. L. Conway, “MPM Timing Simulation”, ACS AP #67-115, August 25, 1967. L. Conway, "A Proposed ACS Logic Simulation System", IBM-ACS, October 31, 1967. L. Conway, "ACS Logic Design Conventions: A Guide for the Novice", November 29, 1967. L. Conway, "The Computer Design Process: A Proposed Plan for ACS", IBM-ACS, August 6, 1968. EVENT: “IBM ACS System: A Pioneering Supercomputer Project of the 1960's”, Computer History Museum, February 18, 2010. VIDEO: Introduced by Mark Smotherman, “IBM ACS System: A Pioneering Supercomputer Project of the 1960's”, Computer History Museum, February 18, 2010. VIDEO: “Lynn Conway receives 2009 IEEE Computer Society Computer Pioneer Award”, IEEE Computer Society, July 10, 2010. B. Latour and S. Woolgar, Laboratory Life. The Social Construction of Scientific Facts, Vol. 80, Sage Library of Social Research, Sage Publications, Beverly Hills, 1979. D. Crane, Invisible Colleges. Diffusion of Knowledge in Scientific Communities, Univ. of Chicago Press, Chicago, 1972. D. Englebart, R. Watson, J. Norton, Advanced Intellect Augmentation Techniques, Report No. NASA-CR-1827, Stanford Research Institute, Menlo Park, CA, Feb. 1972. F. P. Brooks, Jr., The Mythical Man-Month: Essays on Software Engineering, Addison-Wesley, 1975. J. Licklider and A. Vezza, "Applications of Information Networks", Proceedings of the IEEE, Vol., 66, No. 11, November, 1978. J. Lederberg, "Digital Communications and the Conduct of Science: The New Literacy", Proceedings of the IEEE, Vol., 66, No. 11, November, 1978. I. Hodder, Symbols in action: Ethnoarcheological studies of material culture, New Studies in Archeology, Cambridge University Press, 1982. L. Conway, “The Design of VLSI Design Methods”, Proc. of ESSCIRC’82: Eighth European Solid-State Circuits Conference, Brussels, Belgium, Sept. 22-24, 1982; p. 106-117. T. Streeter, The Net Effect: Romanticism, Capitalism, and the Internet, New York University Press, 2011, pp. 95-102, 117, 130, 171, 183, 202. G. Gilder, Microcosm, Touchstone, 1989, p.165-192. L. Conway, "ACS Logic Design Conventions: A Guide for the Novice", IBM-ACS, November 29, 1967. G. Gilder, Sexual Suicide, Quadrangle, 1973. G. Gilder, "Moral sources of capitalism", Society, September/October 1981, Volume 18, Issue 6, pp 24-27. G. Gilder, Wealth and Poverty, Basic Books, 1981. G. Gilder, Men and Marriage, Pelican Publishing, 1986. R. Walker, Silicon Destiny, C.M.C. Publications, 1992. T. P. Hughes, Human-Built World: How to Think about Technology and Culture, University of Chicago Press, 2004, pp. 103-105 (re G. Gilder). G. Gilder, The Silicon Eye, W. W. Norton & Company, 2006. J. Wawrzynek, K. Asanovic, "CS250 VLSI Systems Design Fall 2009", EECS Department, U. C. Berkeley, Fall 2009. L. Conway, “Reminiscences of the VLSI Revolution: How a series of failures triggered a paradigm shift in digital design”, IEEE Solid State Circuits Magazine, VOL. 4, NO. 4, FALL 2012. C. House, “A Paradigm Shift Was Happening All Around Us”, IEEE Solid State Circuits Magazine, VOL. 4, NO. 4, FALL 2012. C. Séquin, “Witnessing the Birth of VLSI Design”, IEEE Solid State Circuits Magazine, VOL. 4, NO. 4, FALL 2012. K. Shepard, ““Covering”: How We Missed the Inside-Story of the VLSI Revolution”, IEEE Solid State Circuits Magazine, VOL. 4, NO. 4, FALL 2012. C. Burns, "Meeting Lynn Conway", Just Plain Sense (blog), February 20, 2013. M. Casali-Rossi, "The Heritage of Mead & Conway: What Has Remained the Same, What Has Changed, What Was Missed, and What Lies Ahead", Proceedings of the IEEE, Vol. 102, No. 2, February 2014.